Hugo keeps putting Paul and I on good bass as we leave the hot spawning bay without connecting with any more Grande's though we see 4 or 5 more boil or jump and vow to come back later for the holy grail of the Grande topwater bite! We just kept catching bass after bass. 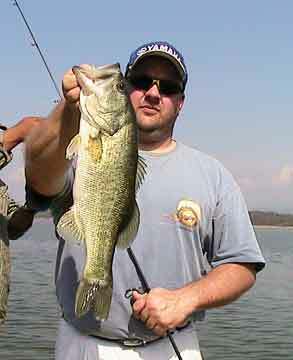 Lake Comedero has a ton of bass of all sizes and we catch them all. Most of them fight hard and most head for the thorn trees. I can't help but wonder how many big bass we can lose because the abrasive thorn trees are like sandpaper and the bass are really good at finding the branches fast!! Even the small ones would often wrap us up. Hugo had a talent for getting most of them out of the trees. Like this solid bass Paul see-sawed off a thorn tree eventually with the help of bass fishing guide Hugo. You didn't want to use wimpy line, but size of the line sometimes seemed to make a difference in the number of bites. Every morning and evening we'd begin and end with the topwater bite. This morning I had landed 3 solid bass on a black Super Spook – the hot topwater as the week progressed – and on back-to-back casts off a shallow bar out in the lake, after catching the 3rd nice one, a big 5-10 largemouth smashed the Super Spook. I'll have another post soon more on the topwater bite on Lake Comedero, but Paul and I did end the day in our morning spawning bay hoping to crash a true toad. No big topwater bites, but Paul had a couple cracks at some big bass that again used thorn trees to their advantage.